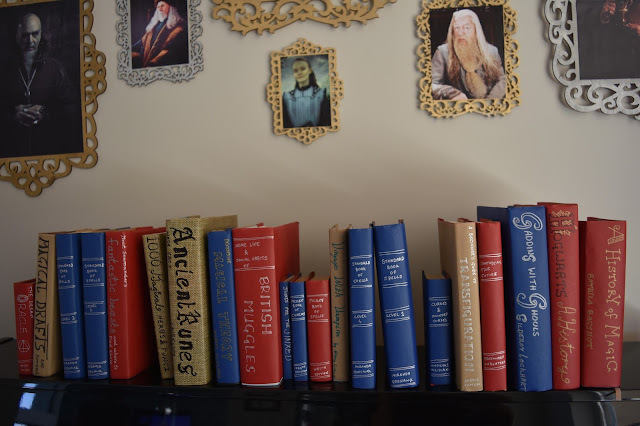 Fantastic Beasts and Where to Find Them releases tomorrow! 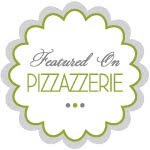 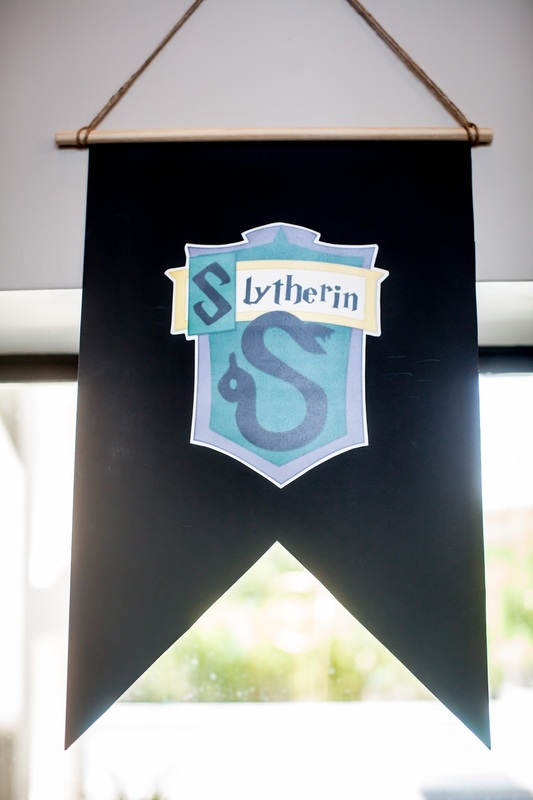 We can't wait!! 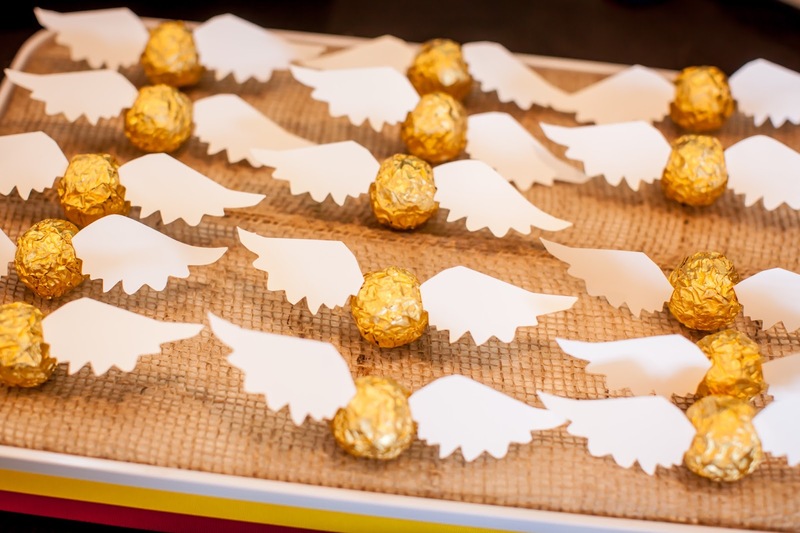 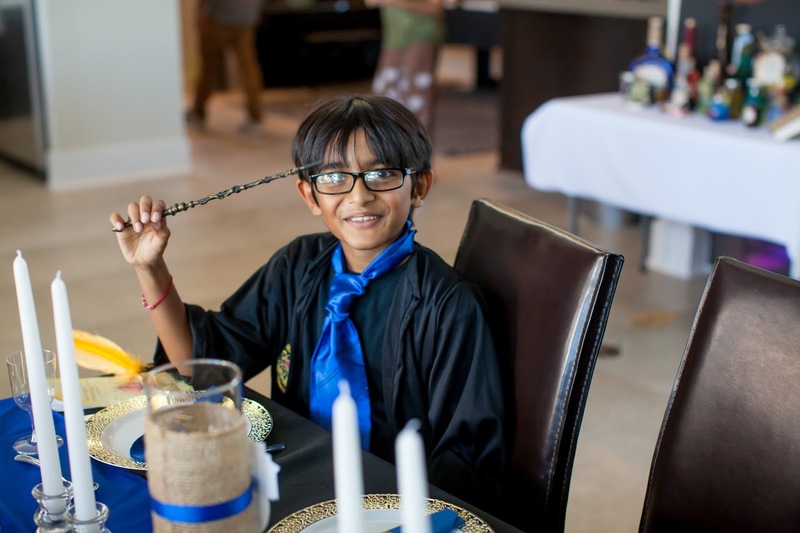 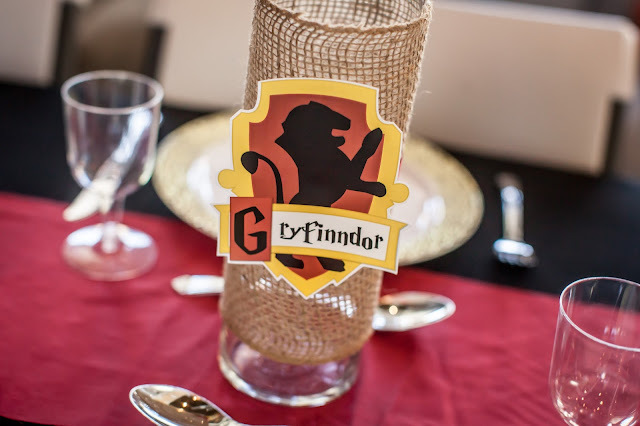 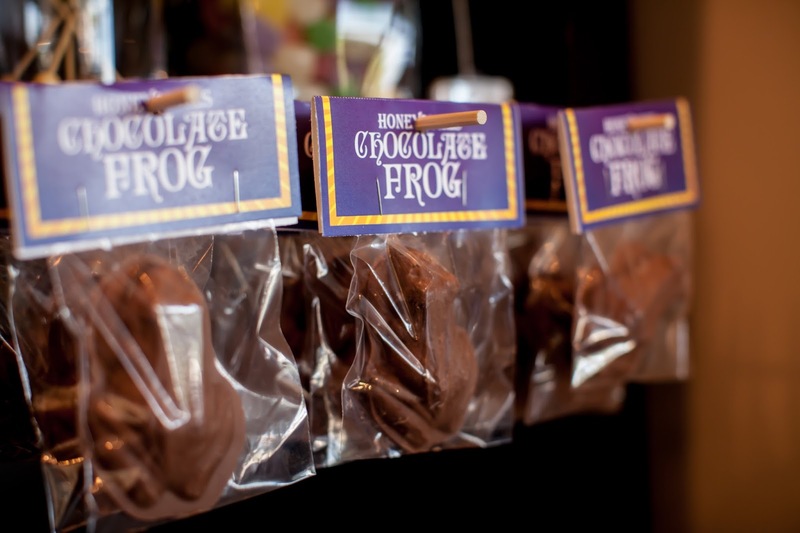 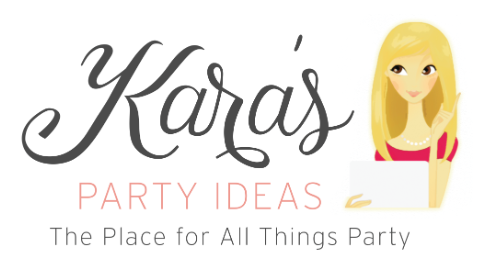 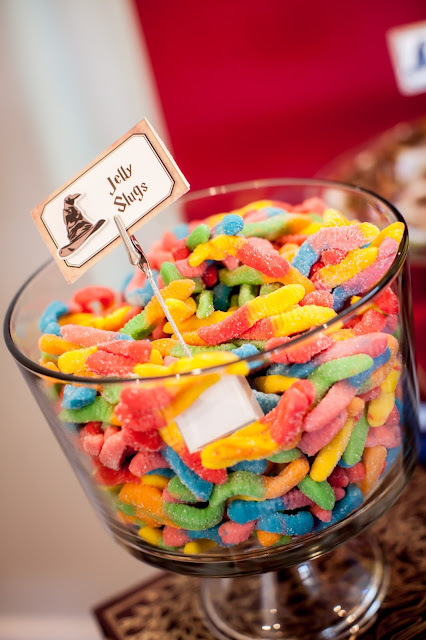 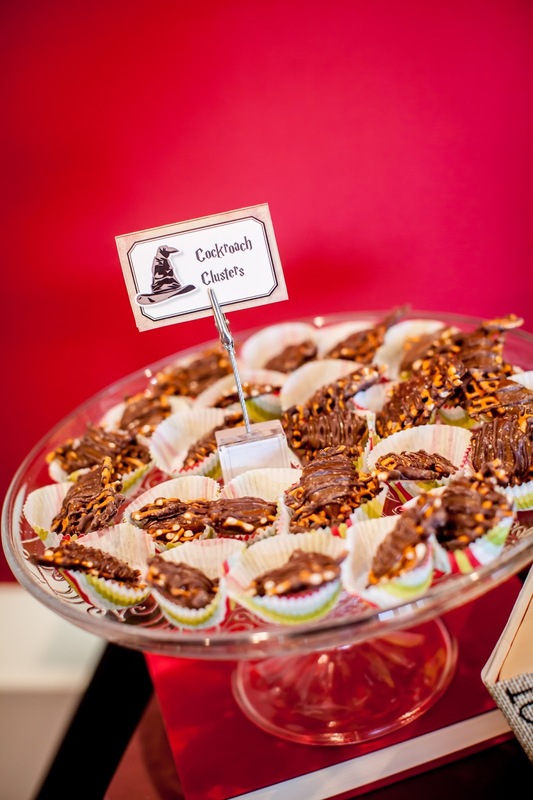 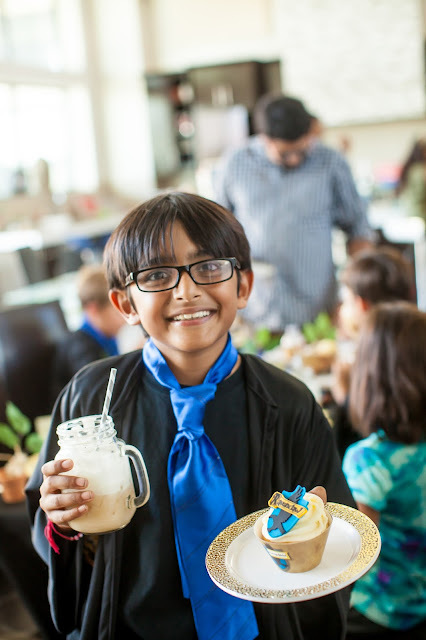 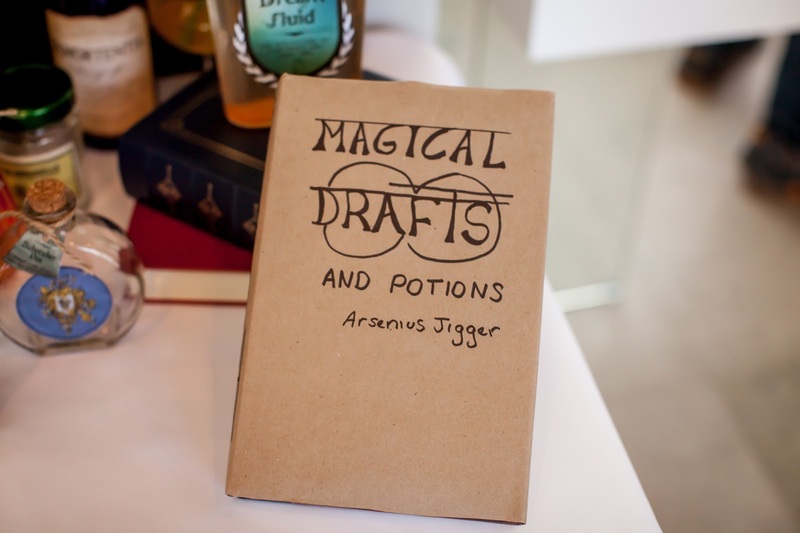 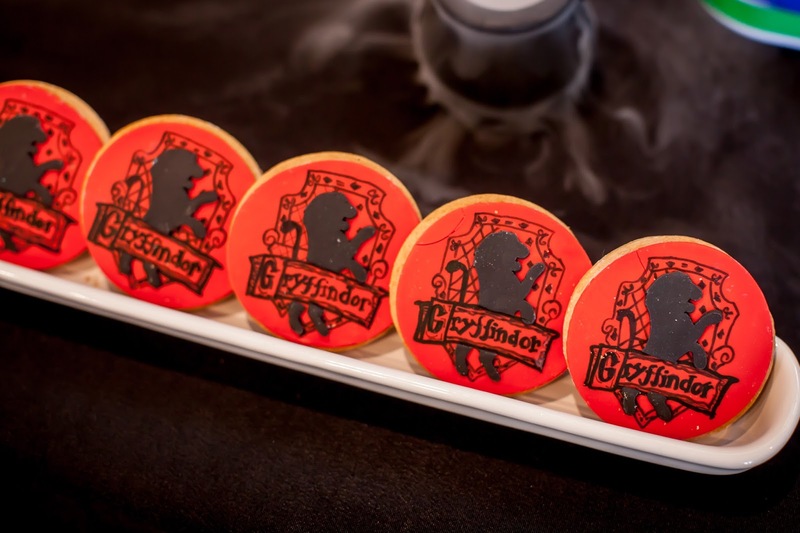 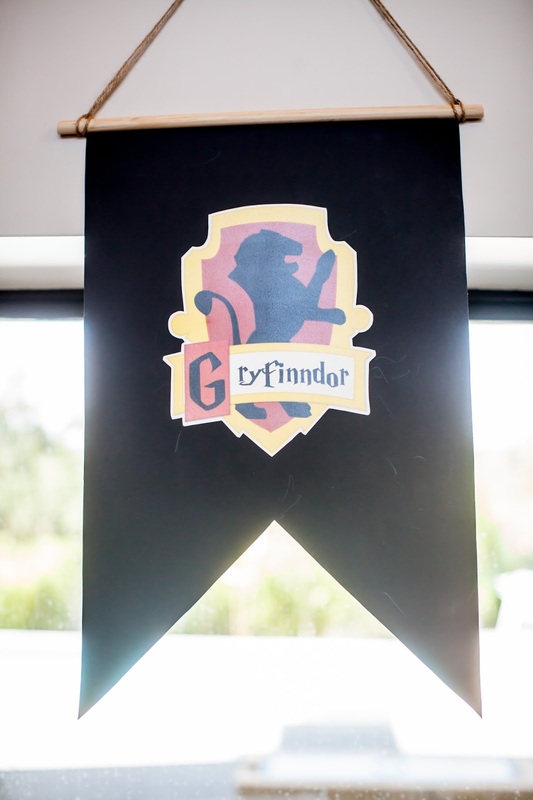 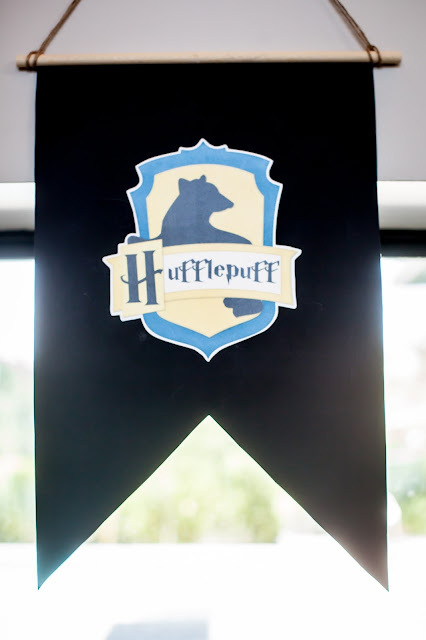 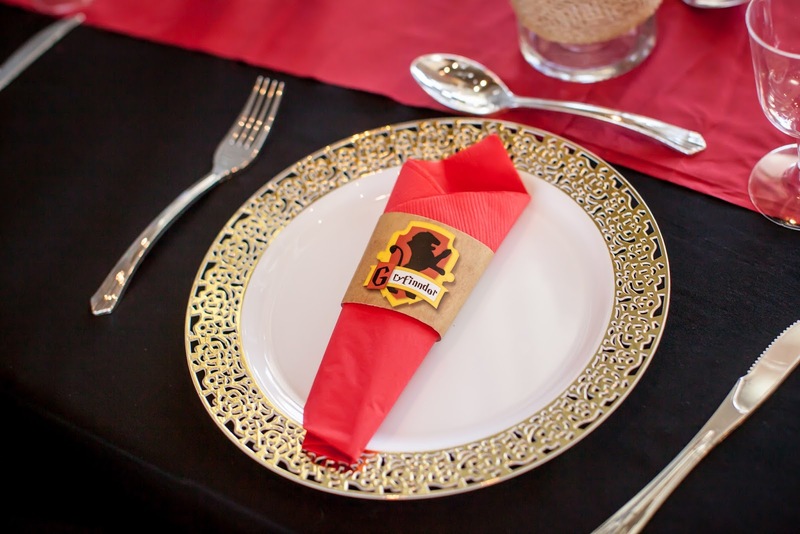 So here's the second of two posts about this magical Harry Potter inspired party. 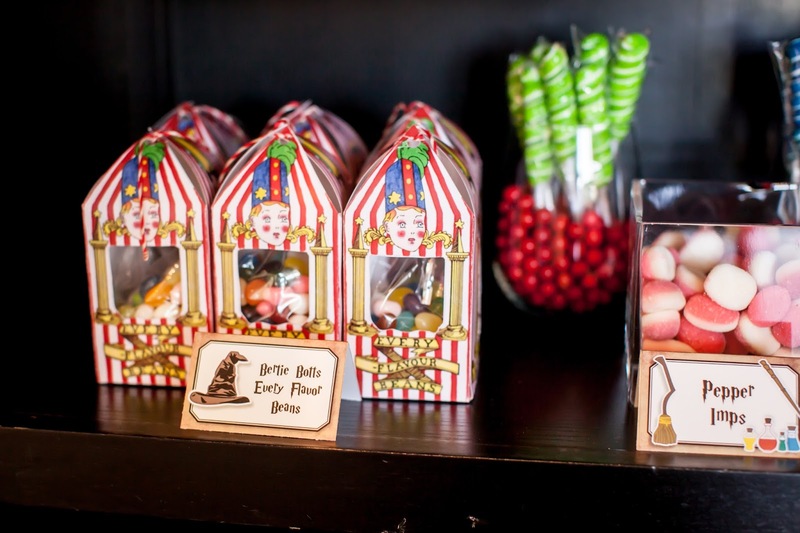 After lessons were over, the students were allowed a trip to Hogsmead. 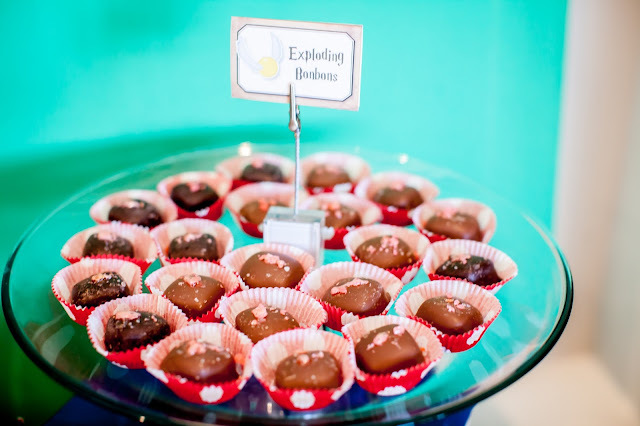 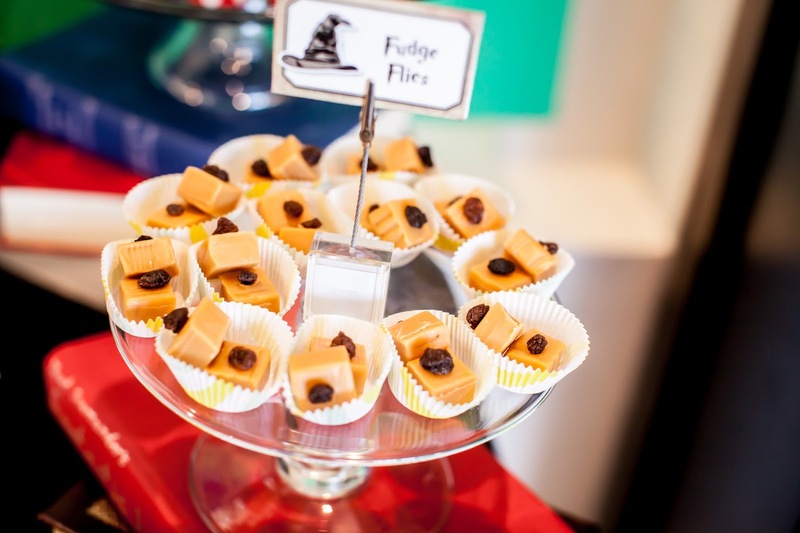 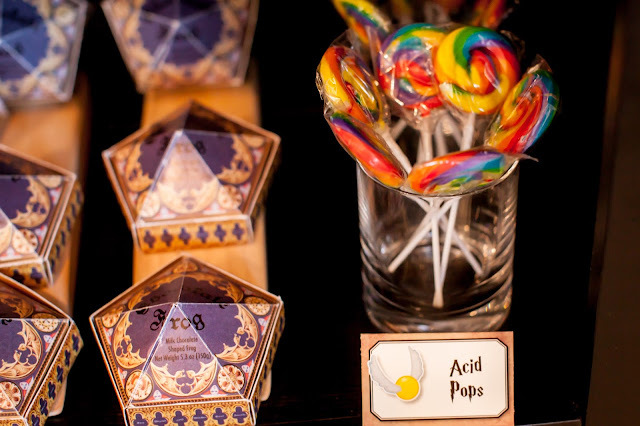 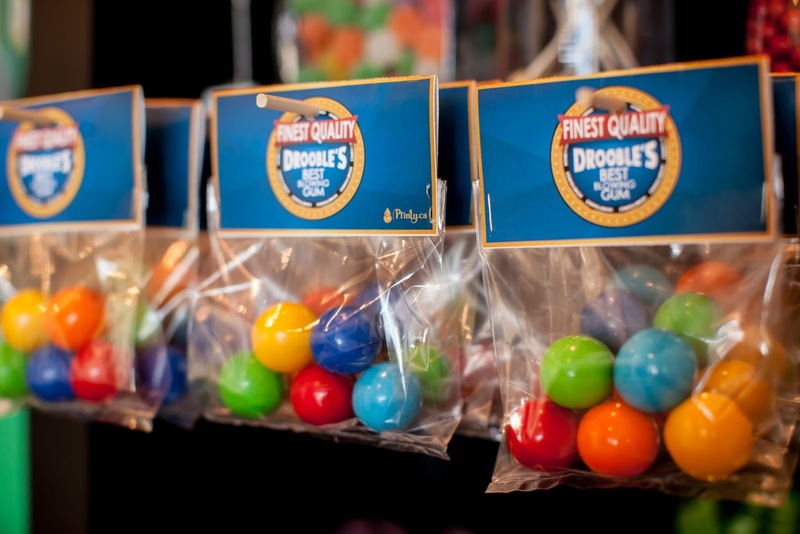 The dessert table is always very popular, but this time, the Honey Dukes Candy Shop was the crowd favorite. 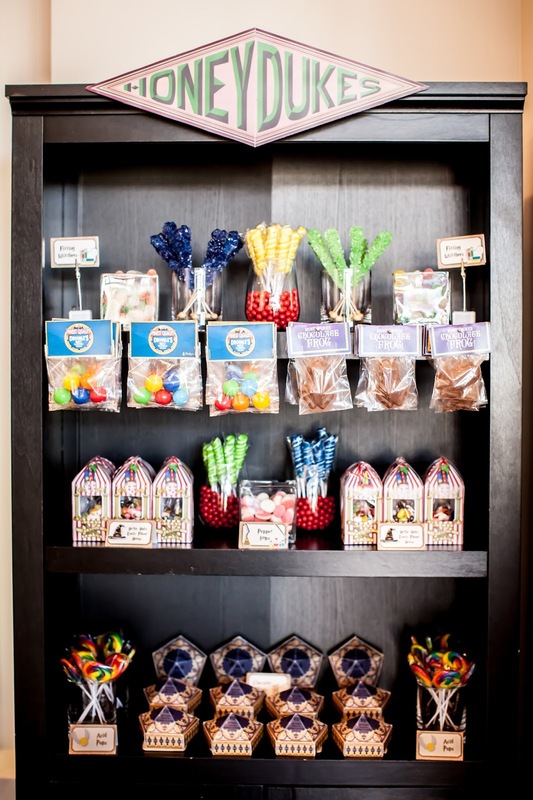 I took a bookcase I had and loaded it with home-made Chocolate Frogs, jelly beans from Party City re-packaged as Every Flavor Jelly Beans, and various other candy from Party City labeled as Pepper Imps, Acid Pops, Droobles Best Blowing Bubble Gum, and Fizzing Whizzbees. 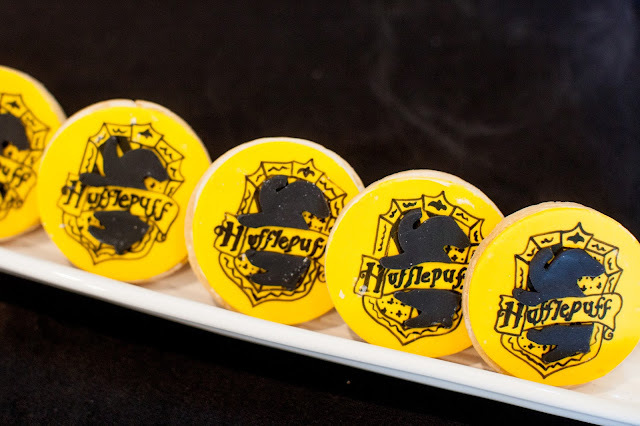 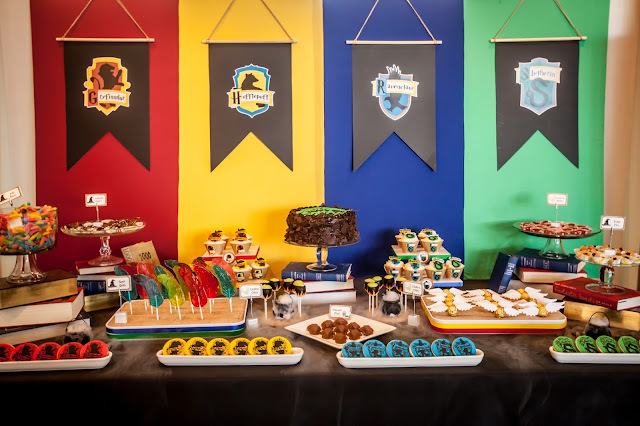 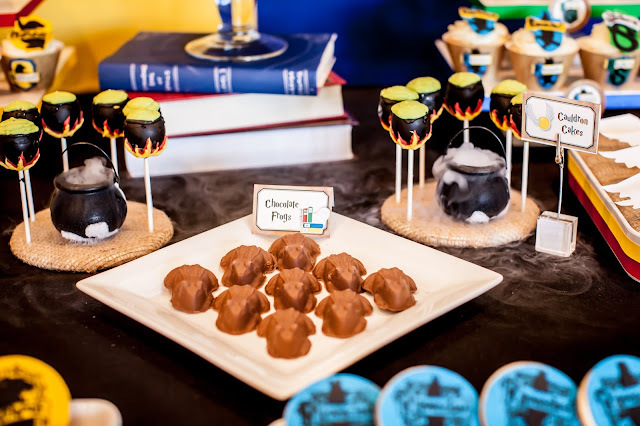 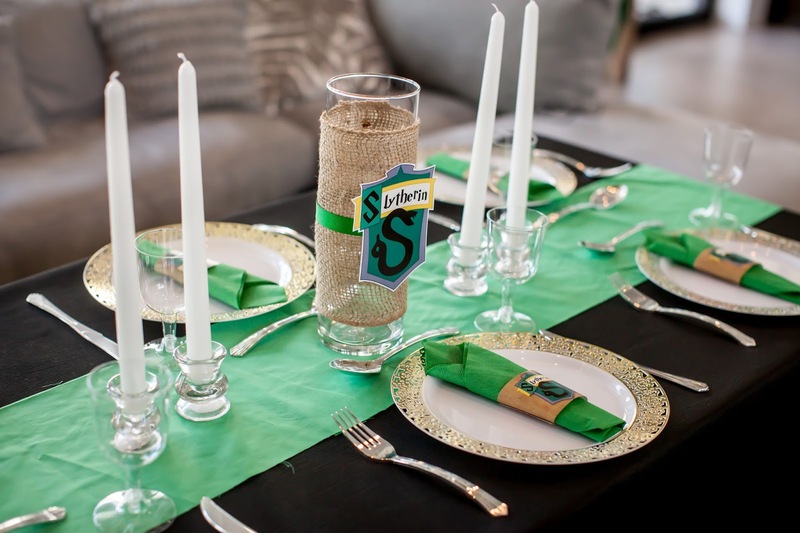 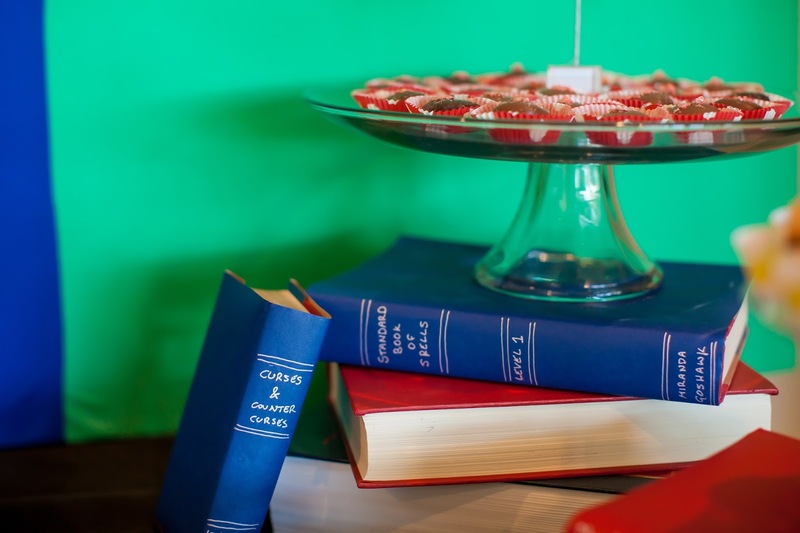 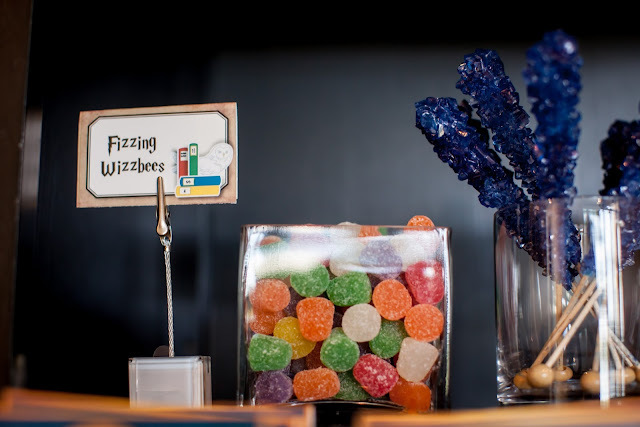 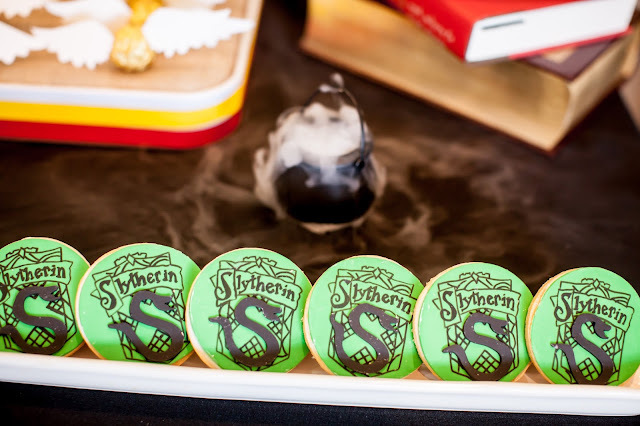 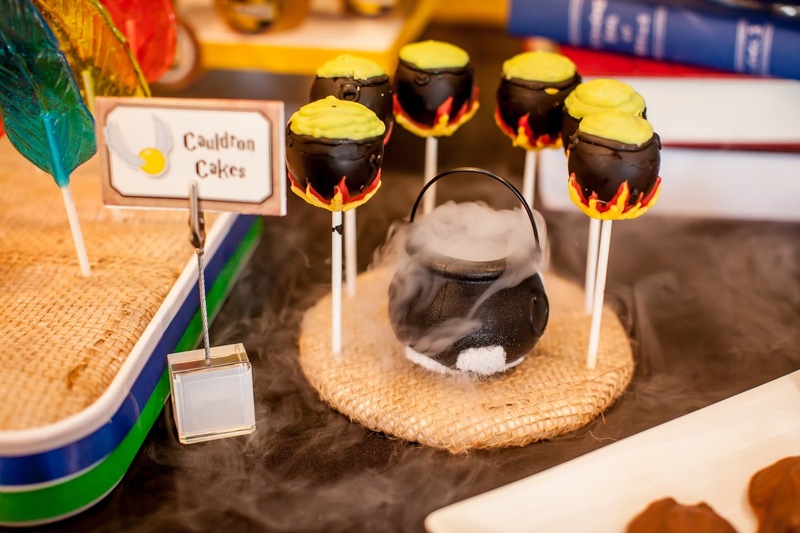 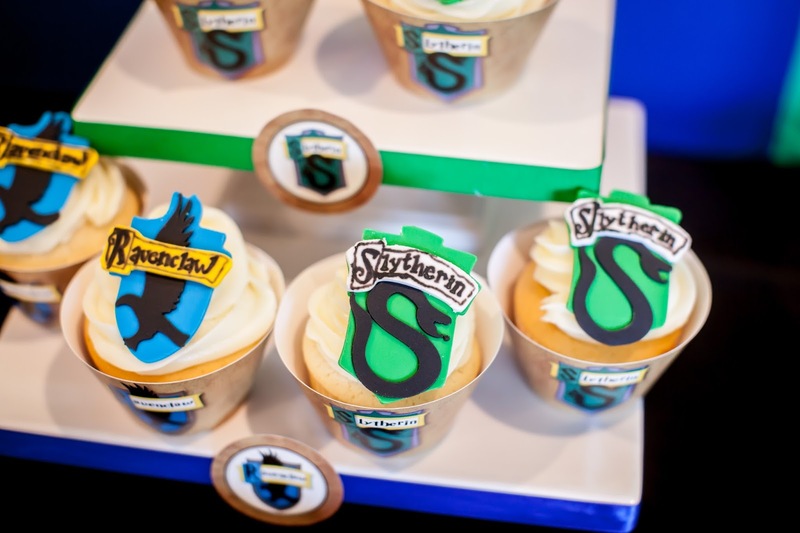 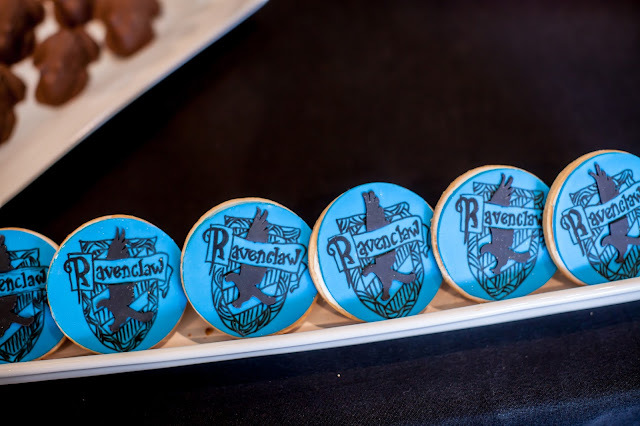 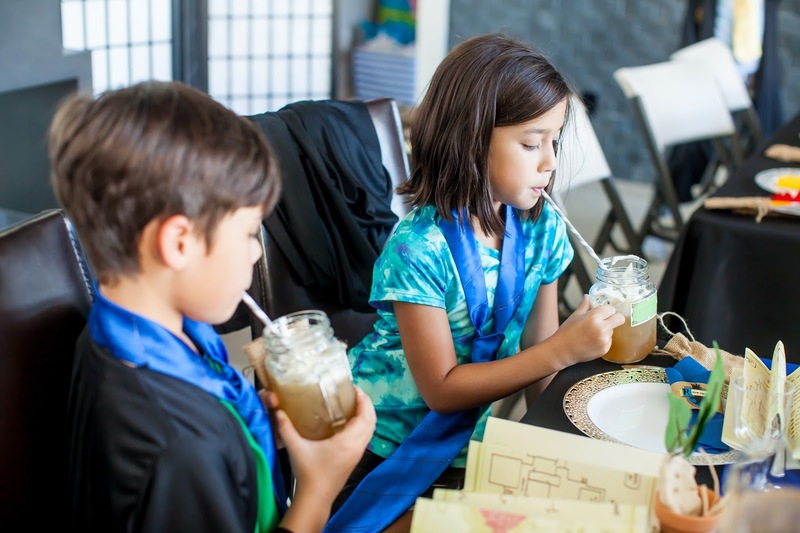 The dessert table was themed around the four Hogwarts houses—Gryfinndor, Ravenclaw, Hufflepuff and Slytherin, with house banners representing each house and decorated with magical textbooks and cauldrons filled with dry ice. 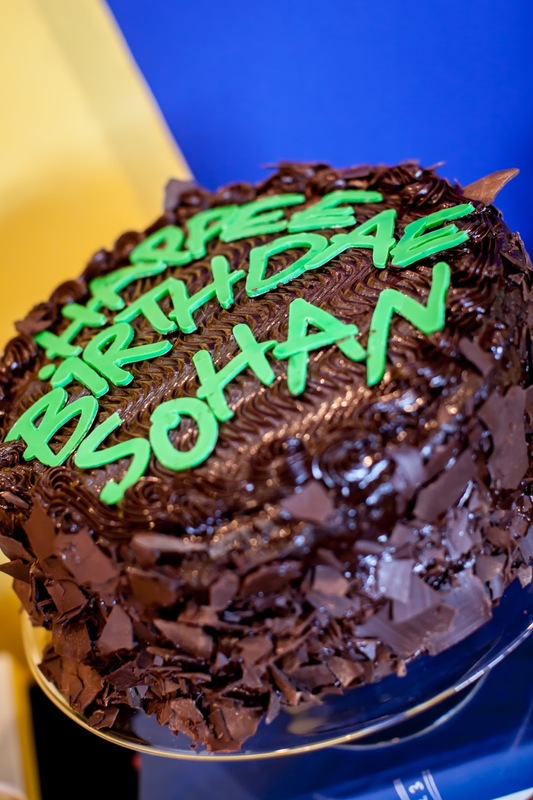 The birthday cake was topped with the words “Happee Birthdae Sohan” akin to the birthday cake Hagrid makes for Harry’s 11th birthday in the first book. I made Sugar Quills with melted Jolly Rancher hard candy and Golden Snitches with Ferrero Roche chocolates. I also plated various store-bought chocolates and truffles as follows: salted caramel truffles topped with pop rocks became Exploding Bon Bons, chocolate pretzel bites became Cockroach Clusters, caramels with raisins became Fudge Flies, gummy worms became Jelly Slugs. 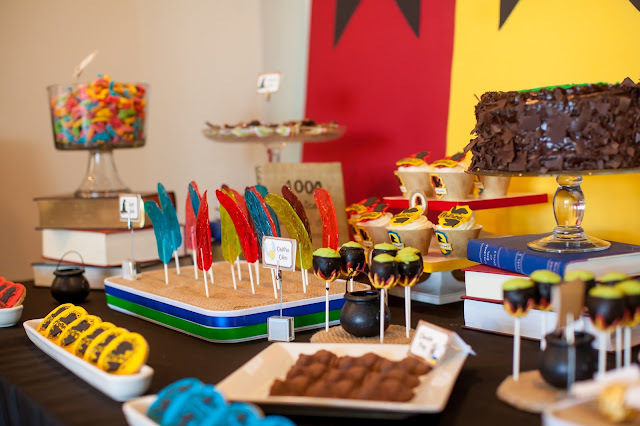 The dessert table also contained house-themed cupcakes with fondant toppers and cookies (artistically designed and decorated by MJ Taboush), and Cauldron Cake cake pops (beautifully decorated and made by Fayes Cake Pops). 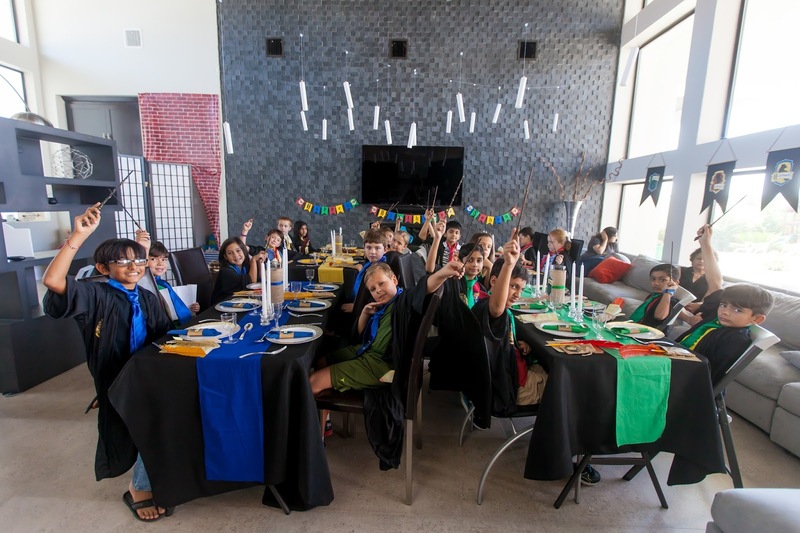 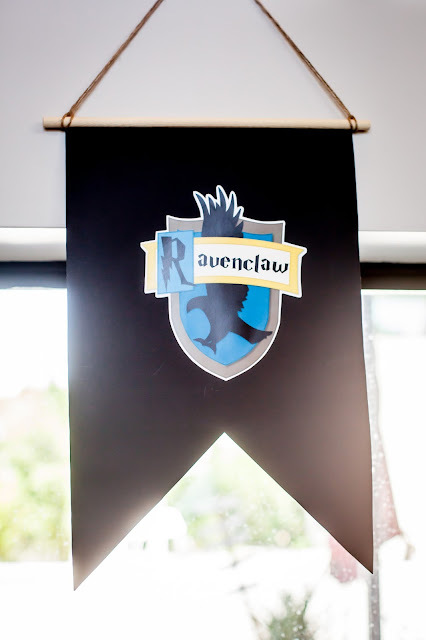 The Great Hall and Hogwarts Grounds: For the party, we essentially transformed our home into Hogwarts—talk about magic! 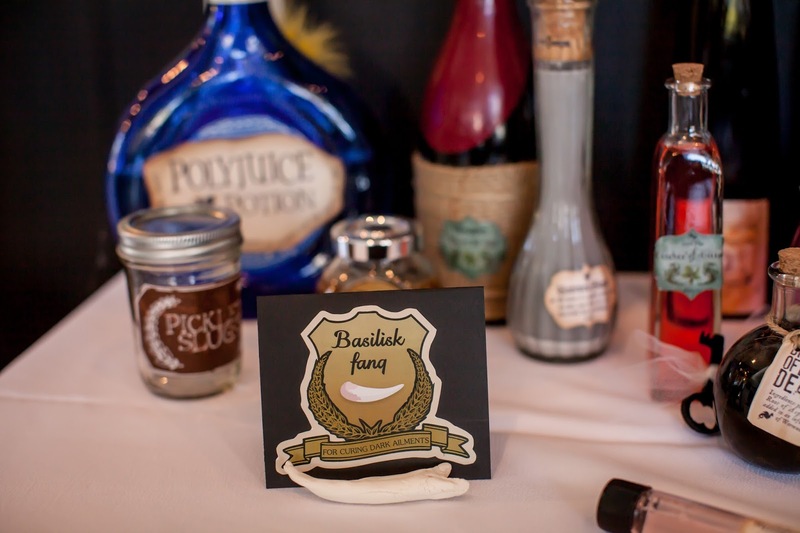 All the fabulous signage came from Etsy Shop, Printyca and the wonderful tabletop printables came from my dear friend at Birdsparty.com. Our living room became the Great Hall, filled with the four house tables decorated in the house colors. 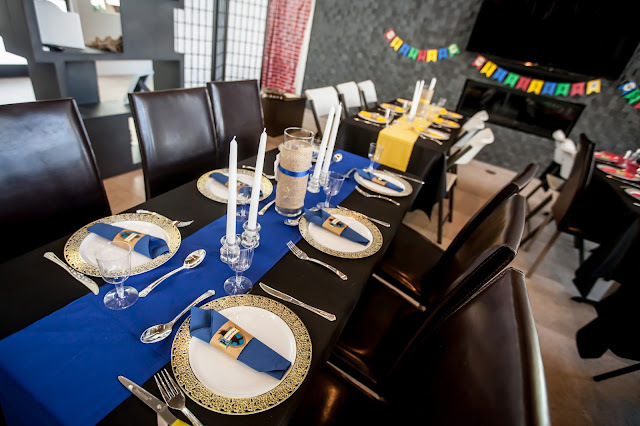 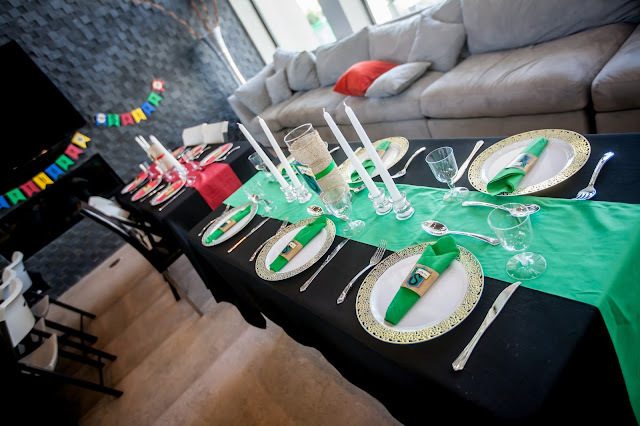 I used fancy plastic tableware from Party City to complete the majestic place settings. 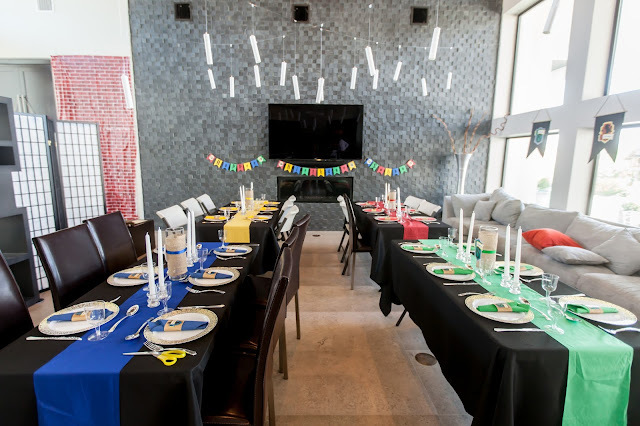 We also had house banners representing each house and floating candles suspended by fishing string over the house tables. 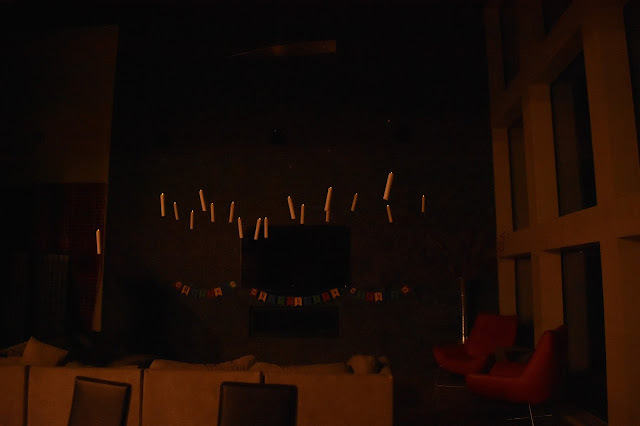 The floating candles were flameless candles that I glued into paper tubes; I dripped glue gun down the sides of each tube to look like dripping wax. 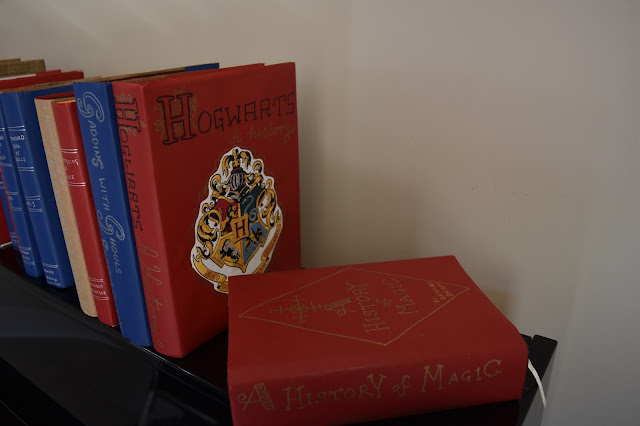 Throughout the space, I stacked magical textbooks—hardback books (mostly my old law text books!) 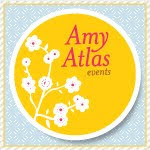 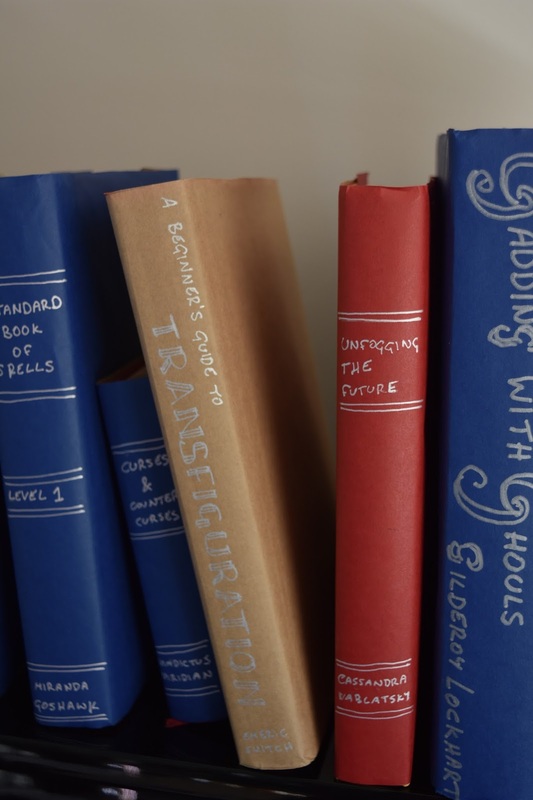 covered with hand made, customized “dust jackets”. 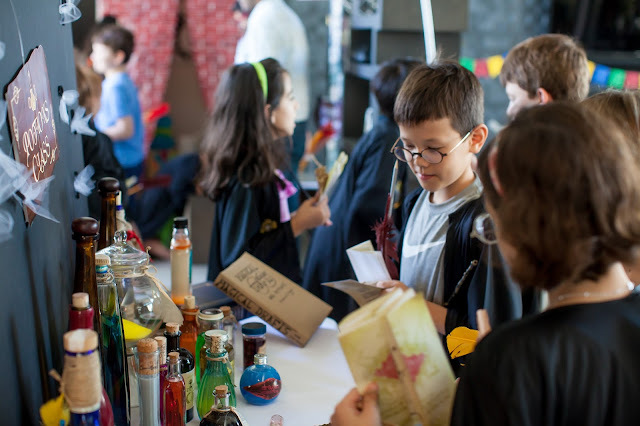 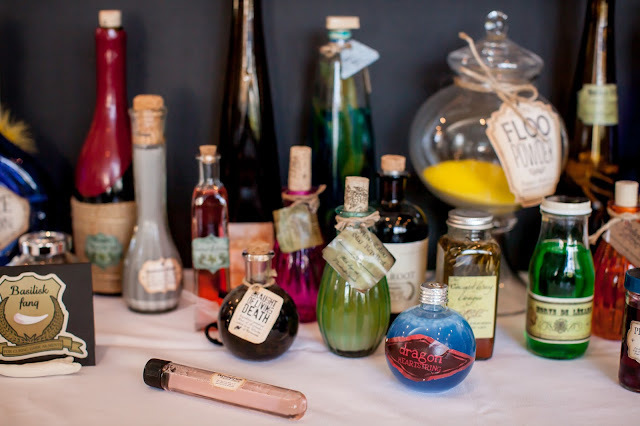 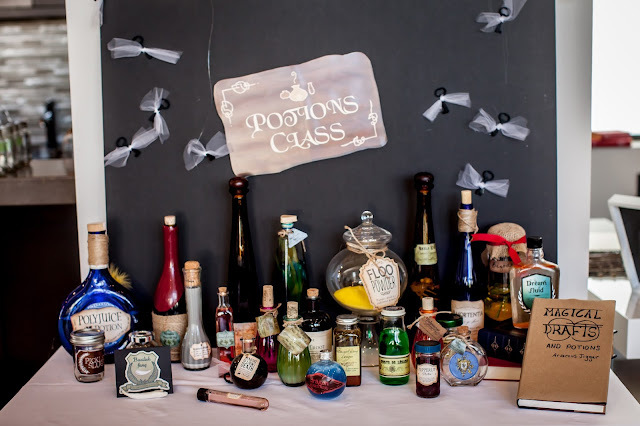 We had great fun creating a potions display using old bottles and jars, labeled as various potions from the books. 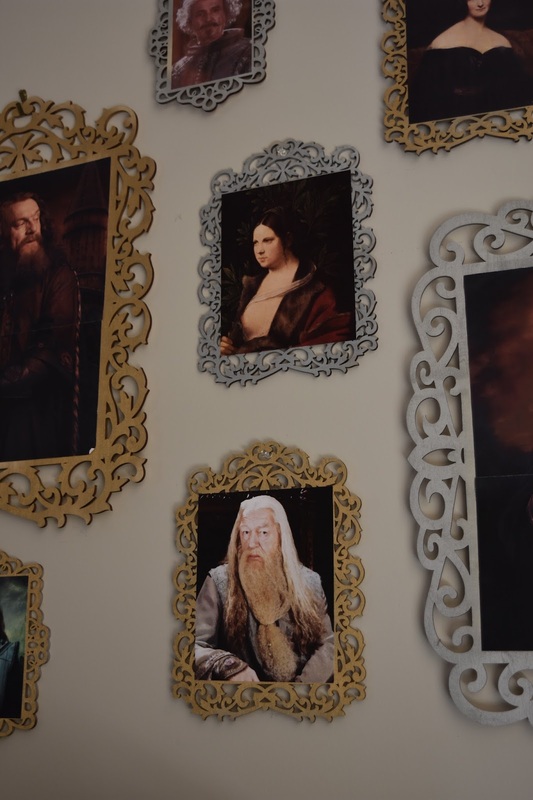 I also created a Hogwarts portrait gallery on one wall, although the portraits did not move. 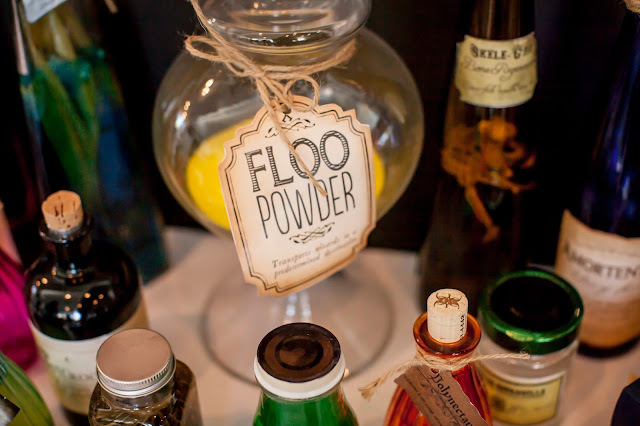 The powder room was decorated as Moaning Myrtle’s toilet and functioned as the Chamber of Secrets in the scavenger hunt game. 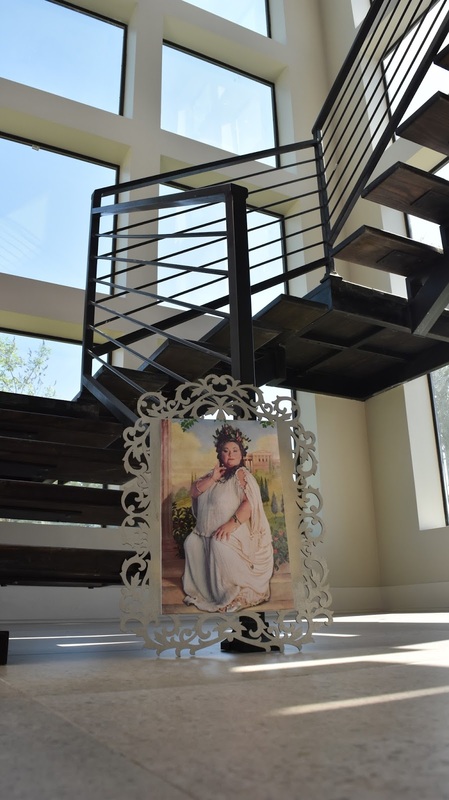 Our floating staircase was perfect to become the castle’s famous shifting stairs, so I set a portrait of the Fat Lady at the base of the stairs. 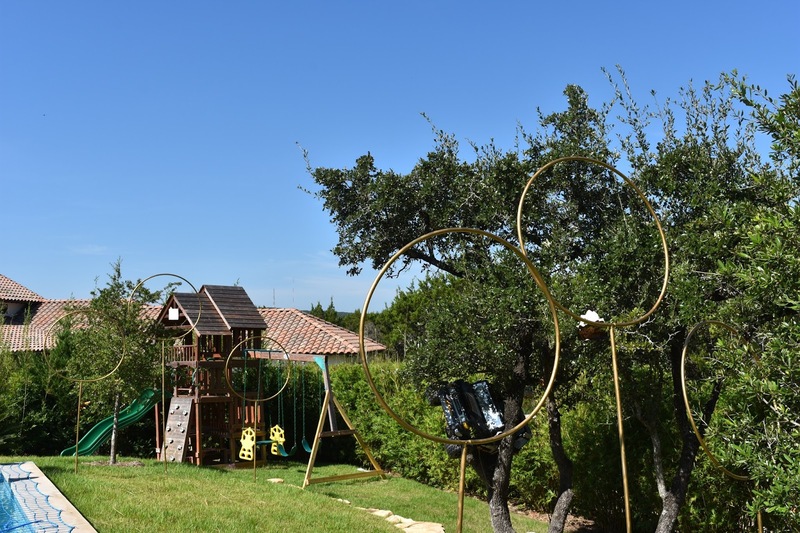 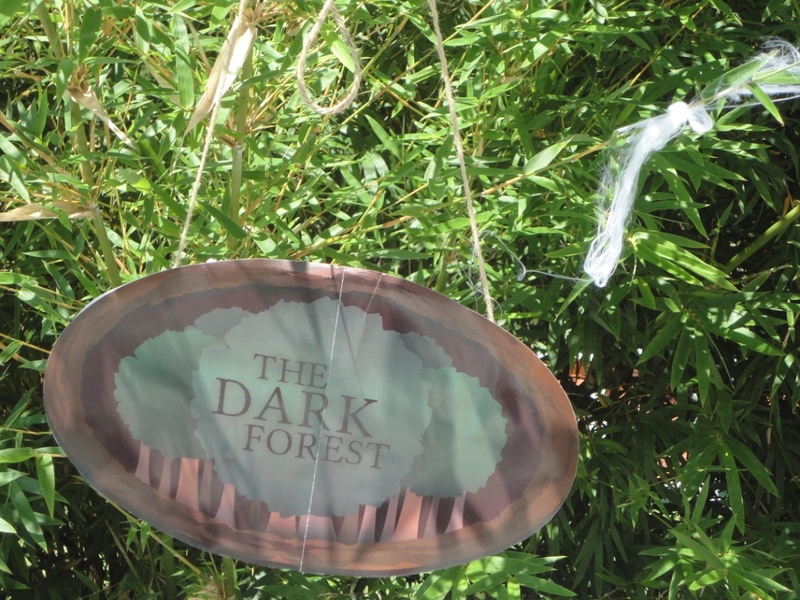 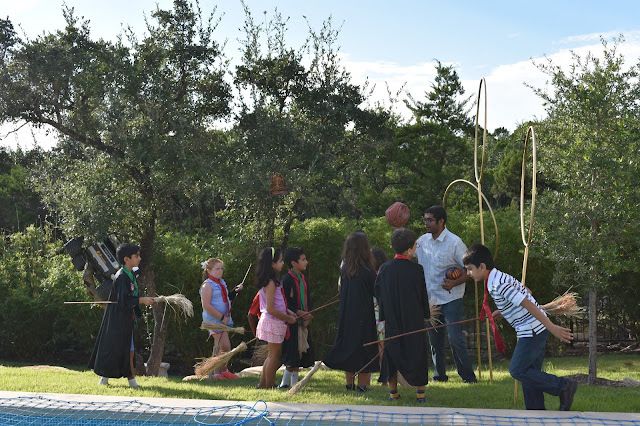 The backyard became the Hogwarts grounds, complete with Quidditch field, Whomping Willow with a car stuck in it, the Dark Forest, and Aragog in his nest. 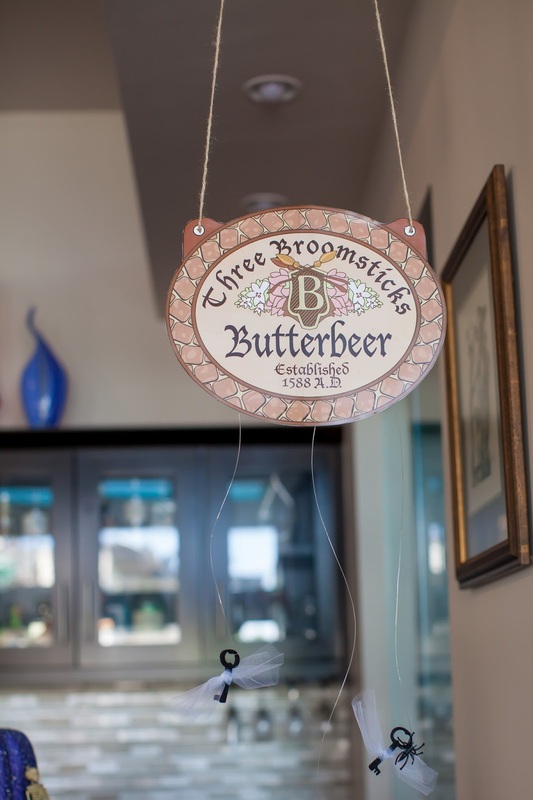 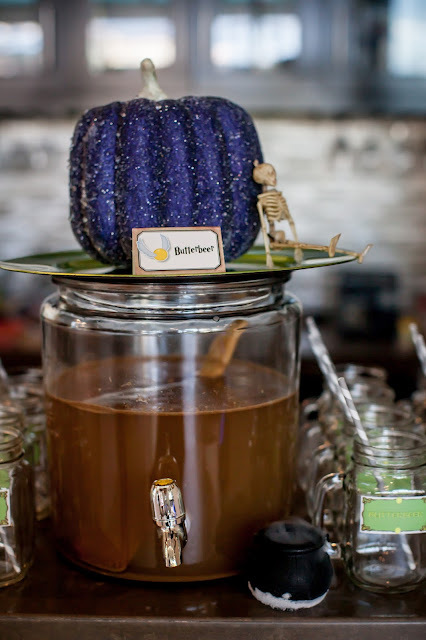 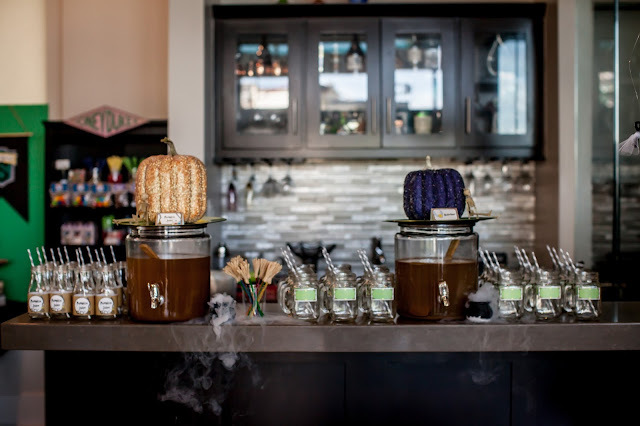 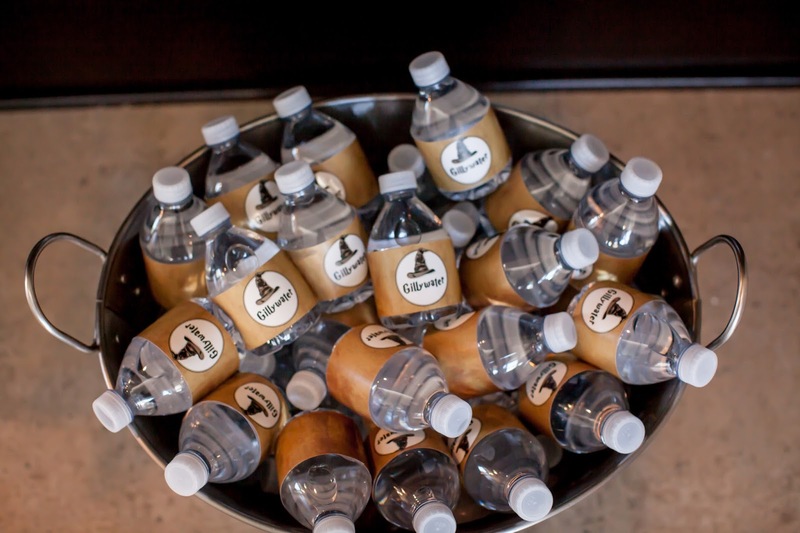 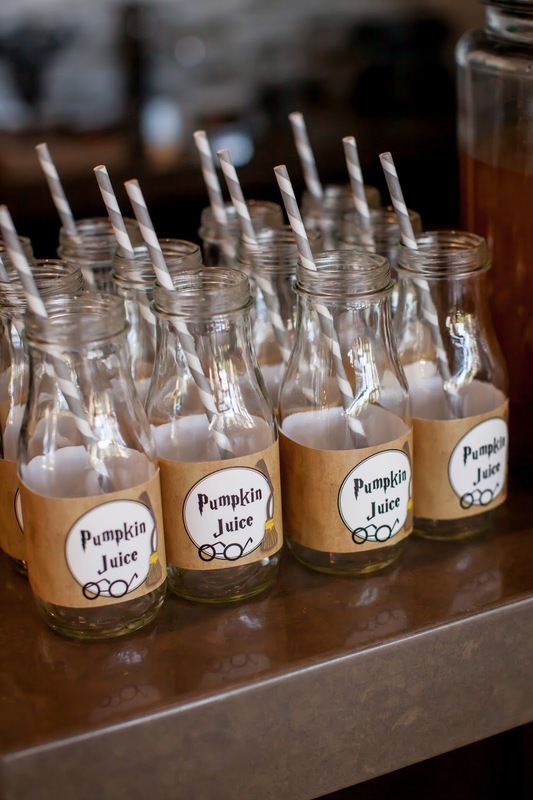 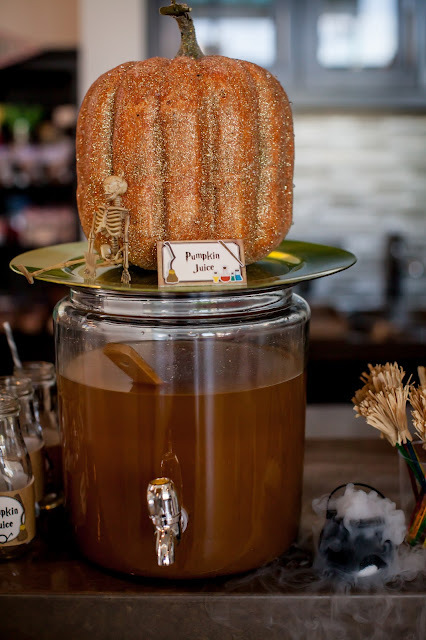 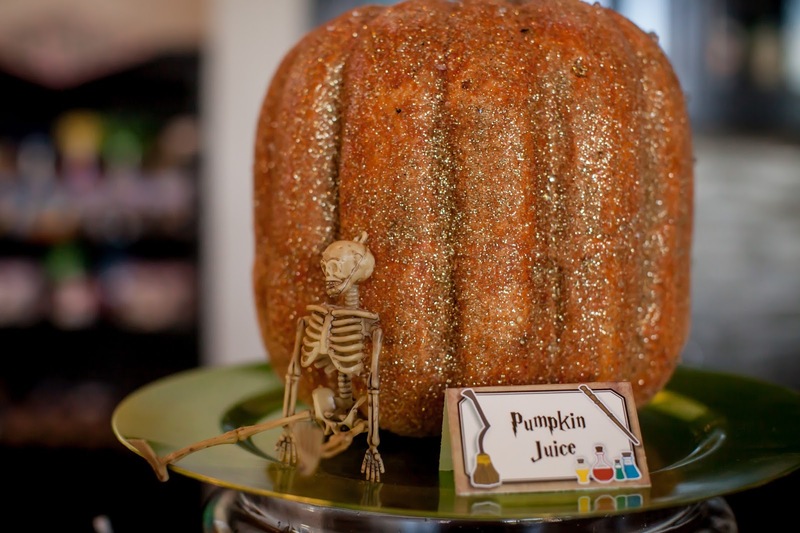 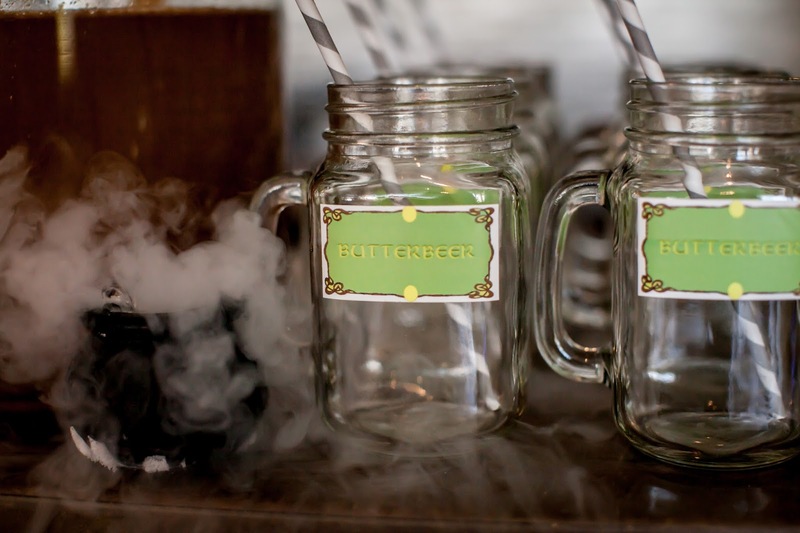 The Three Broomsticks and Hogwarts Kitchen: Our wet bar become the Three Broomsticks, serving up Butter Beer, Pumpkin Juice and Gilly Water. 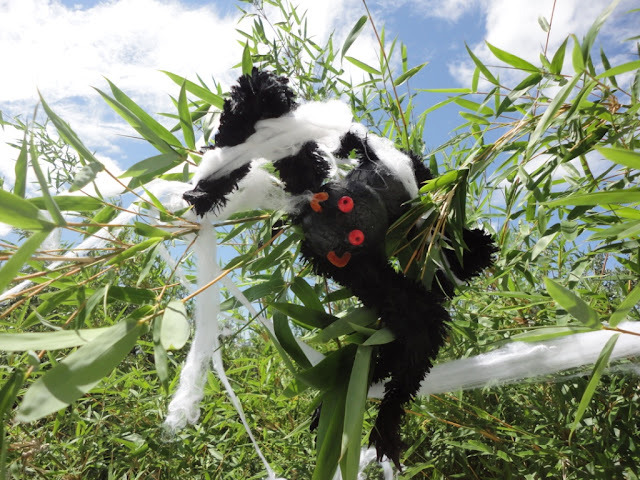 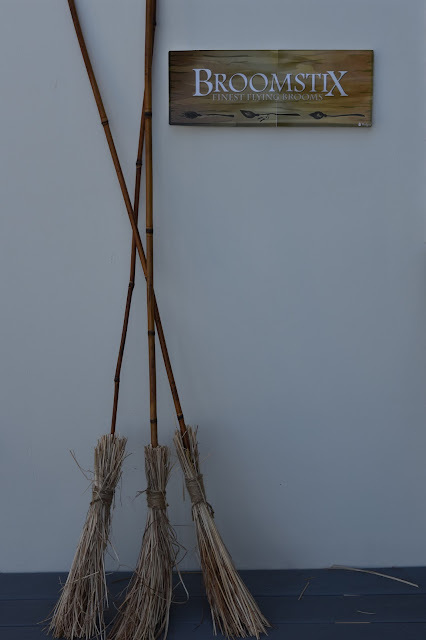 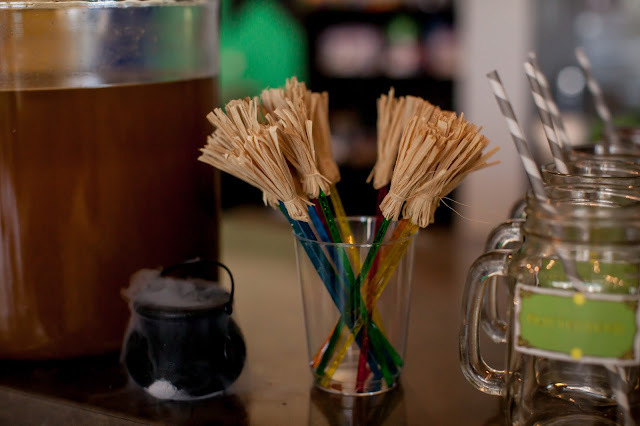 The drink stirrer broomsticks were made using raffia and drink stirrers. 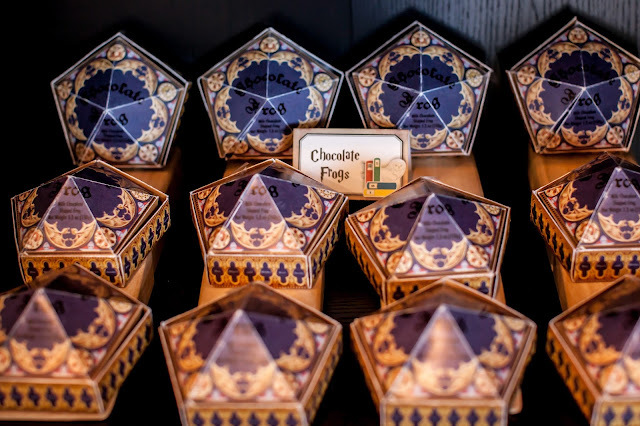 The Hogwarts kitchen served up British fare--shepherd’s pie, fish and chips, scotch eggs—for the Great Feast at the end of the party. 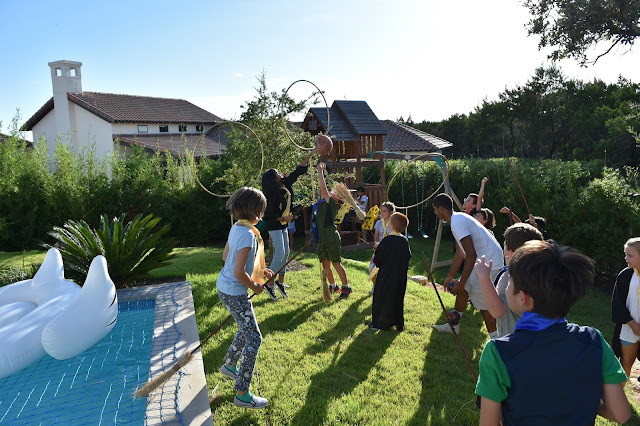 Quidditch Match: After a great afternoon attending lessons and then feasting, the students ended their day with a Quidditch Match. Each student had a broomstick to fly on. 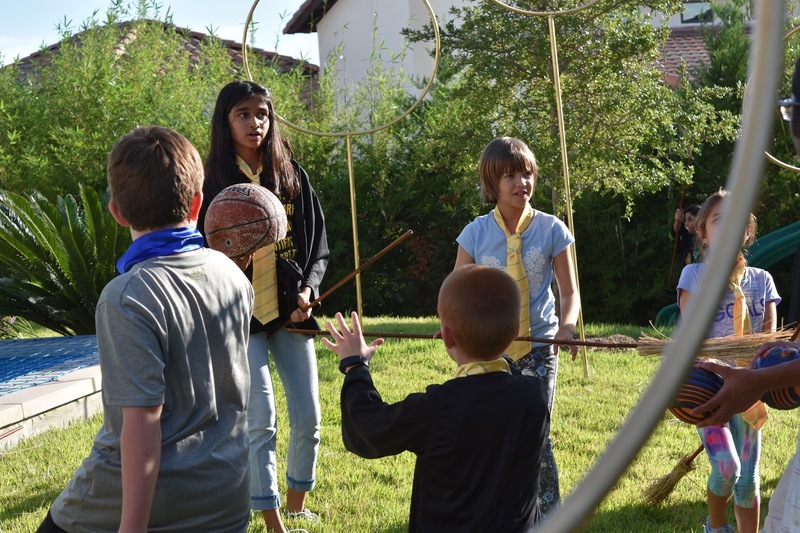 We used a deflated basketball as the Quaffle, three foam balls as Bludgers, and a small foil ball with wings as the Snitch. 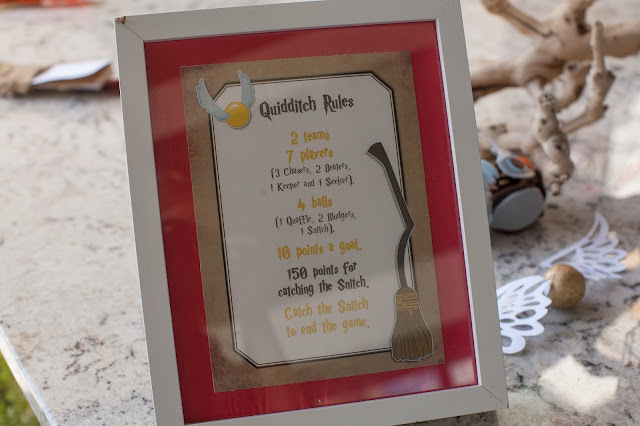 Wrap up, Favors, Daily Prophet Thank you notes: We ended the party by counting up the house points and awarding the house cup. 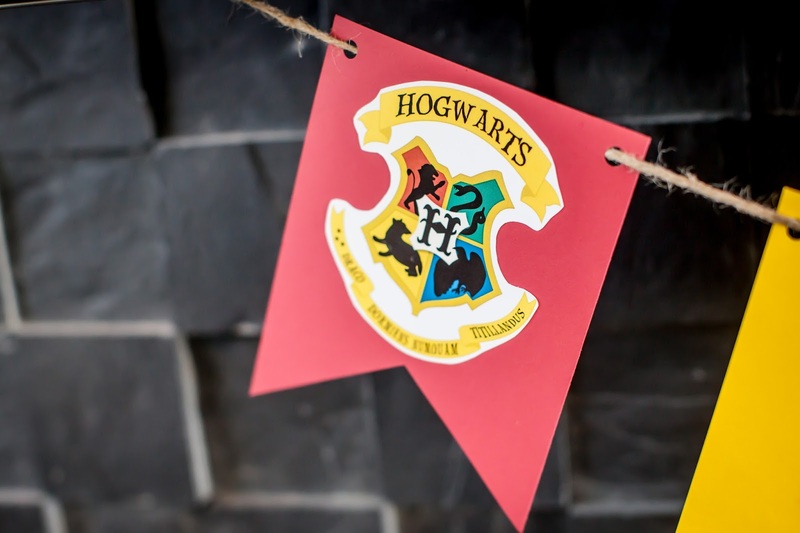 We took make believe to the next level with this party and by the end of the party, the kids were all “in role” and excited to see which house won. 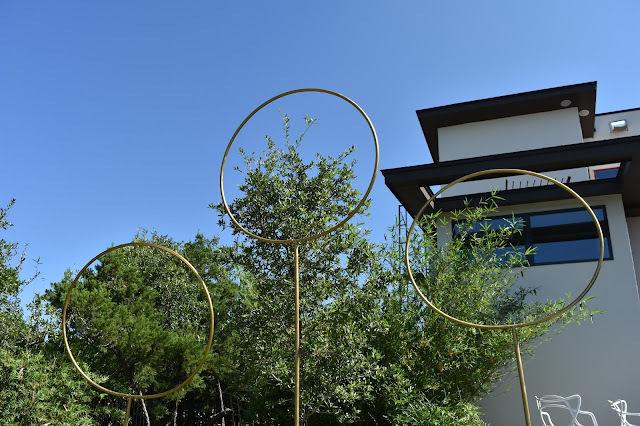 The students left the party with their robes, wands, quills, broom and marauder’s maps. 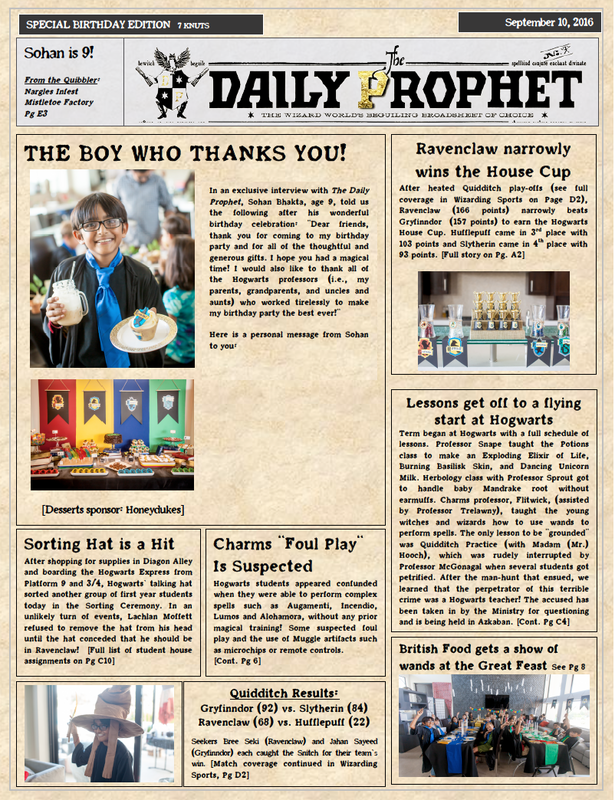 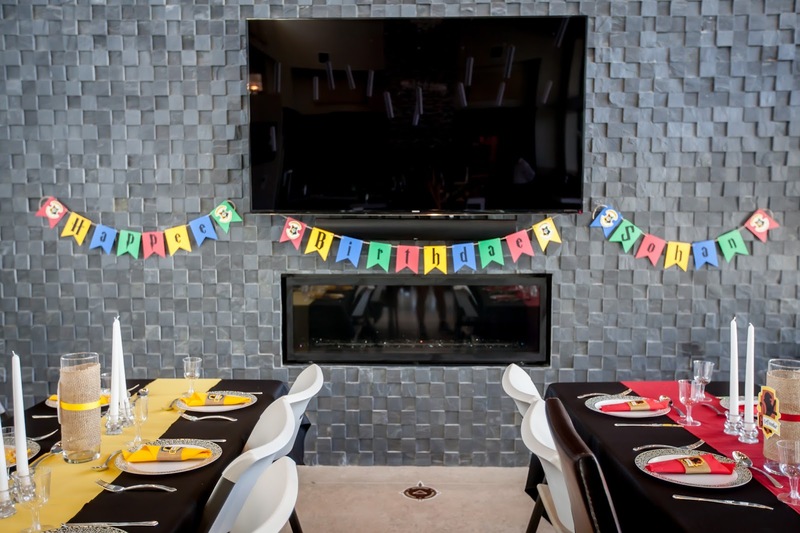 After such a magical party, normal thank you notes just wouldn’t do, so we published a front page of the Daily Prophet, containing photos and stories about events at the party and a personalized thank you from the birthday boy. 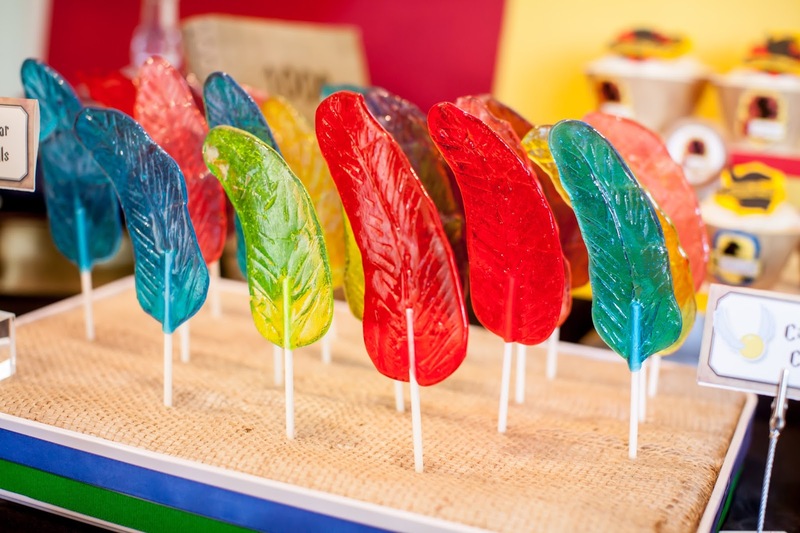 Can you please tell me where you purchased your feather candy mold? 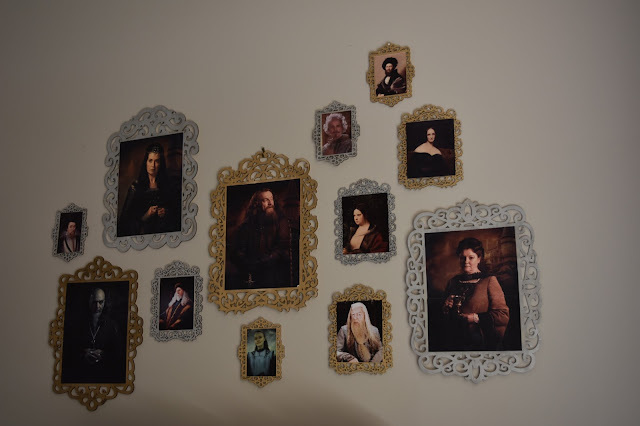 All the ones I find are too small! 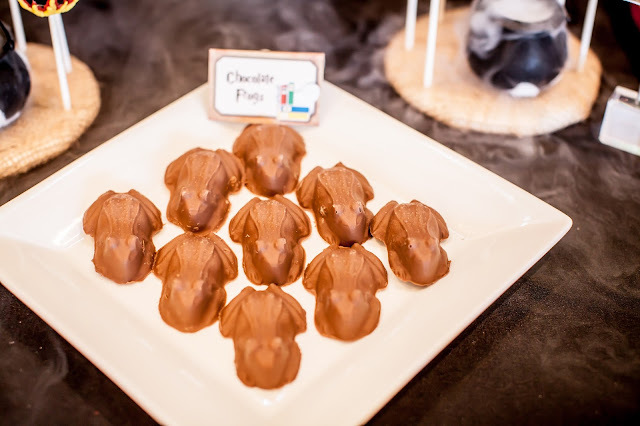 Sondra, actually I didn't use a mold. I melted jolly ranchers on a cookie sheet, then stretched the hot candy into a feather shape and used a toothpick to created lines on it.